Beaver Equipment - Excelsior Blower Inc.
Excelsior Blower Systems is a blower package expert. They have built and installed thousands of blower packages, for both pressure and vacuum applications, throughout the world. They offer both standard designs and custom engineered packages designed to meet exact specifications for applications in the water, wastewater, pneumatic conveying, methane gas recovery and other industries. 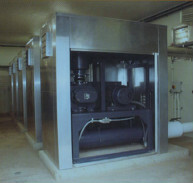 Excelsior Blower Systems is an industry leading engineer and manufacturer of blower packages and acoustic enclosures. As one of the largest blower package manufactuers in the nation we have the proven experience of thousands of installations worldwide.